October is the month of Halloween and often regarded as ‘Pinktober’ and dedicated to raising funds and awareness for Breast Cancer. I have managed to squeeze in three breast cancer events, Patrick’s 15th birthday party, strategy meetings for marketing my books, helped organise the Vintage Calendar Girls Gala Launch and progress the Pop up Book Shop event so I have been tremendously busy. I feel this October has also been filled with book sales and Stroke awareness and maybe I should refer to it as ‘Stroketober’ for me! 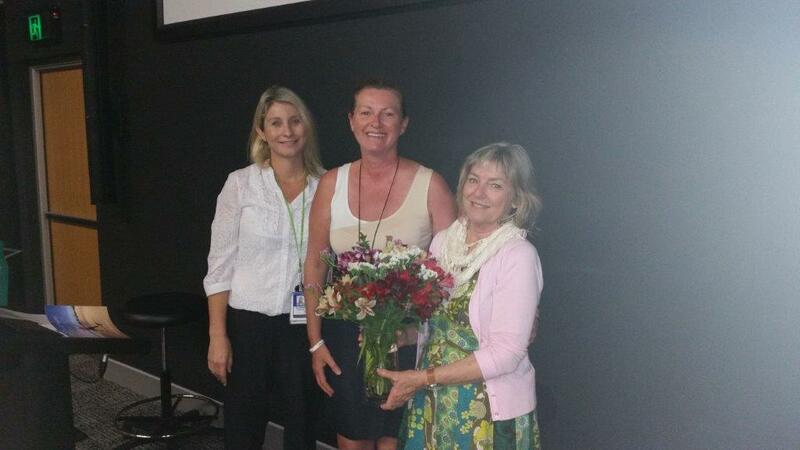 Queensland Mental Health Week ran from 9-15 October and I was invited by Cecelia Scahill, a Mental Health Recovery Nurse, to present at Caboolture Hospital. This was a lovely morning and I had a most receptive audience and spoke about how I used poetry and exercise to get me through my post-stroke depression. The positive feedback was tremendous and here is a photo of me being presented with some lovely flowers from Cecelia. I am always keen to tell my story, raise awareness about stroke and help others with similar health issues and a few weeks ago, I was interviewed for the October edition of Profile Magazine. You can pick up a free copy of Profile Magazine at various cafes and retail outlets on the Sunshine Coast. It’s a two page article and you can read it here. Last week I visited Unity College and had the pleasure of chatting to Class 3.3 and their lovely teacher (Mrs Lennox), who also happens to be my good friend Majella. 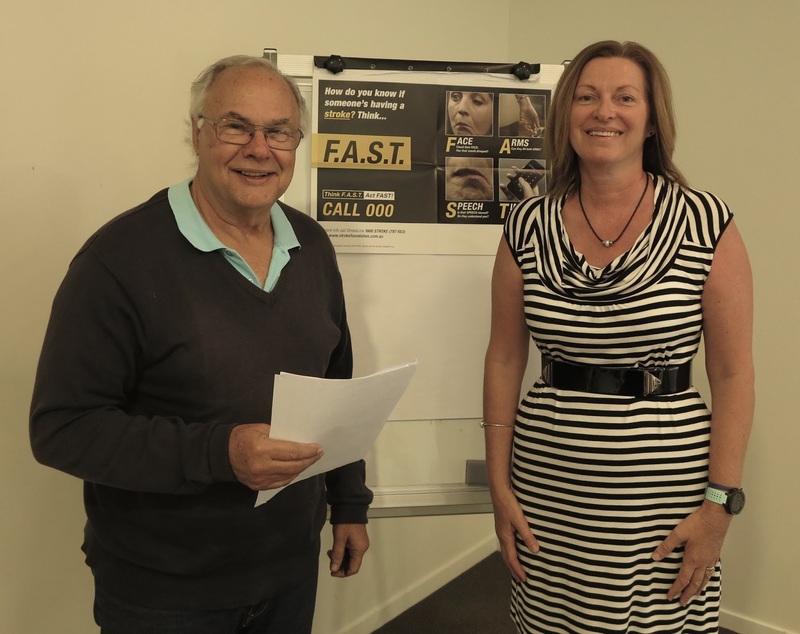 Each week, her class are taught issues about health and we decided it would be a great idea for me to speak with them and teach them the signs of stroke (FAST). They were very welcoming and they were all eager to learn and thankful for the goodies I gave out. I truly believe that you are never too young to learn about stroke or how to detect/prevent a stroke. 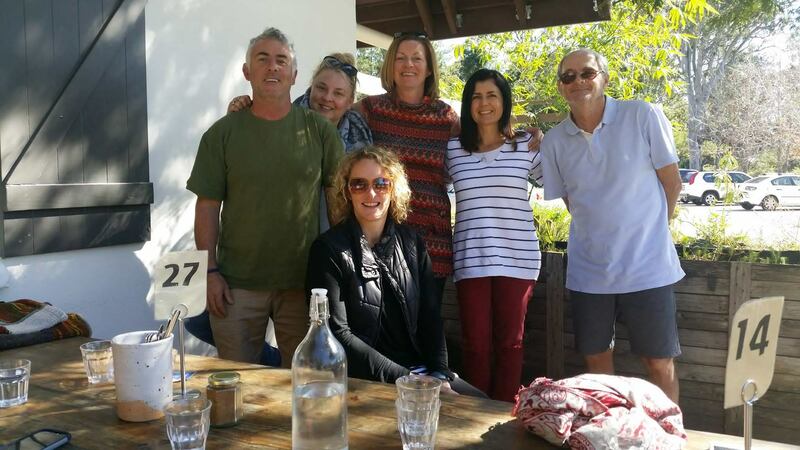 On Saturday 30 October, my good friends and trainers Melinda and Amy, MAB Personal Training and Adventures, organised a Boot Camp in recognition of World Stroke Day. It has been some time since I attended any boot camps and my aching body the following day was testament to the fact I dragged myself up and down those sand hills at Currimundi Lake! Thank you to everyone who came and supported this event and with $5 from everyone’s boot camp fee and donations, we raised $70. I will be sending this to the Stroke Foundation with my next payments from my book sales. 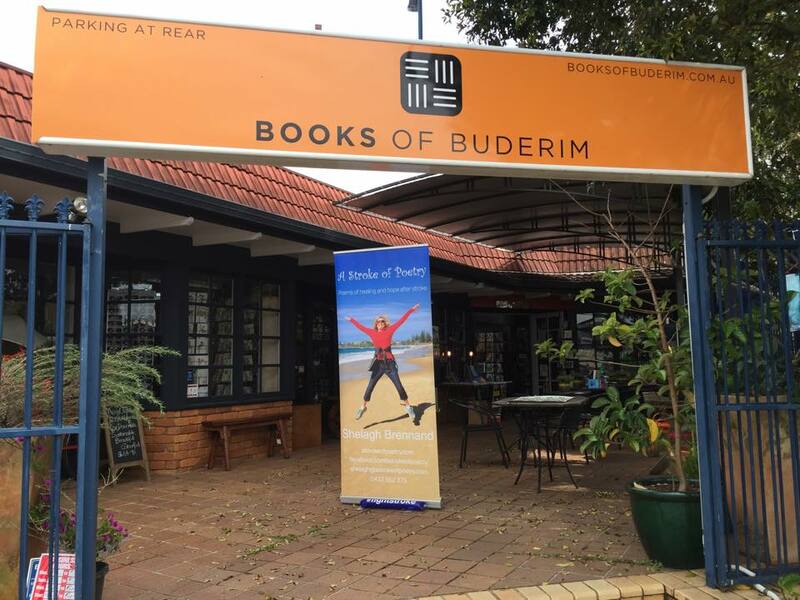 For several months now, my friend Mary, Tamarind Book Club, who helped my organise my own book launch last November, and I have been organising the first Pop up Book Shop to be held on the Sunshine Coast. 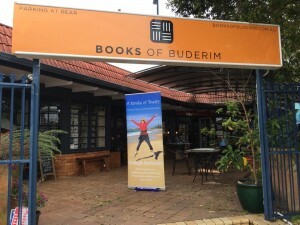 It is to be held this Sunday, 6 November, at the Caloundra Power Boat Club and 30 authors will be hosting tables and showcasing and selling their books. We have a number of children’s authors who will be facilitating colouring tables and a ‘story corner’. Entry is with a gold coin donation in support of the ‘Buy a Bale’ charity and you can read about the event here. I will be hosting a table and selling ‘A Stroke of Poetry’ for $20 but every purchase will include one of my hand made Christmas or Greetings card. A lot of work has gone into this event and runs from 10am – 1pm and there are so many beautiful books to be bought so come along with your Christmas list and I really hope to see you there. That’s it for me for this month and as always, please stay healthy and happy. As September draws to a close, I can say that it has been a very busy month for stroke awareness and for events involving A Stroke of Poetry. 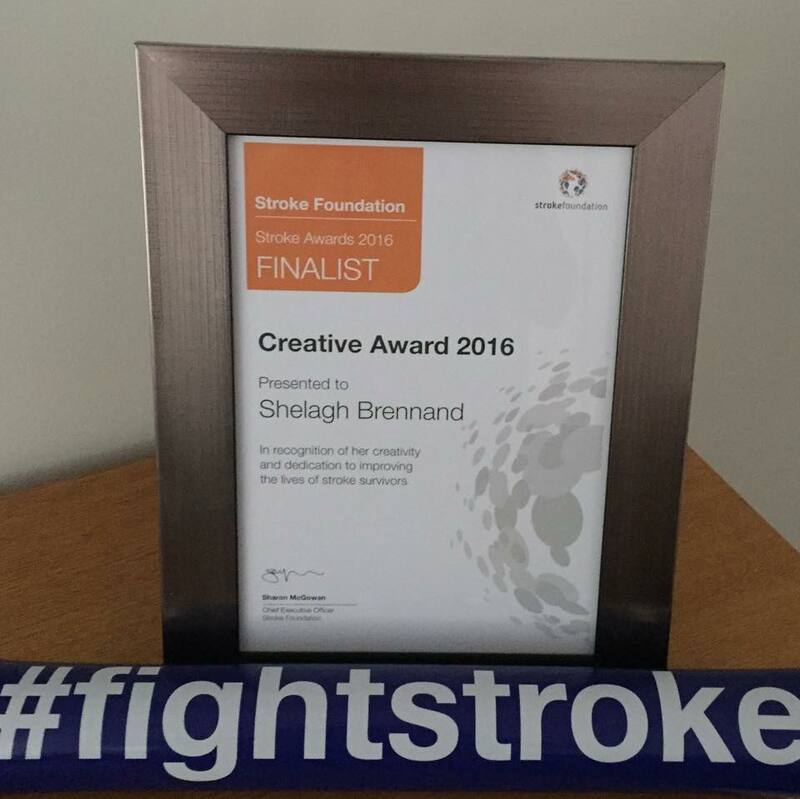 On 2 September, I attended an awards ceremony in Brisbane where I received my certificate due to being nominated as a finalist in the creative category of the Stroke Foundation Stroke awards 2016. I felt very humbled to be chosen alongside some remarkable stroke survivors and supporters of stroke and it was a lovely day. 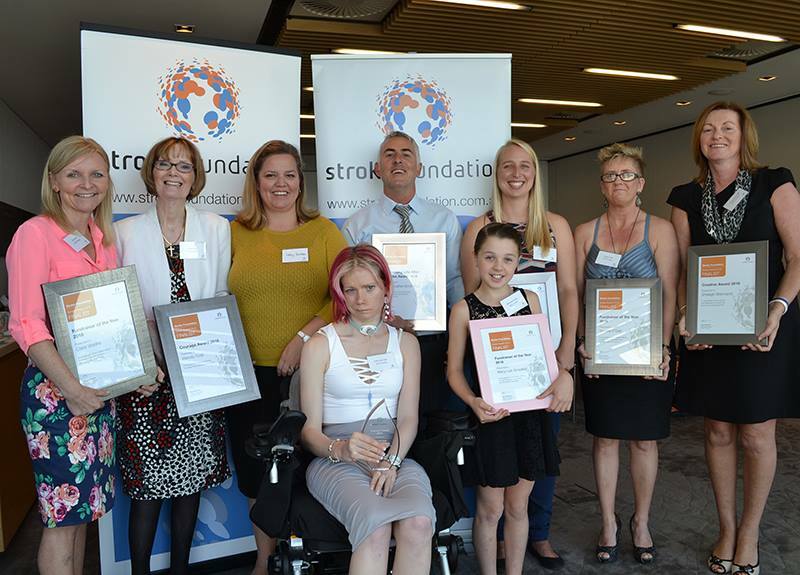 Highlighting survivors of stroke at a very young age is hugely important and I met two amazing people on that day who were more than worthy of their awards (HUGE shout out to Sarah-Jane and Macey-Lee). Stroke Week (12-16 September) was eventful and book signings at Books of Buderim and Rosetta Books, Maleny, brought some lovely people to these bookstores, where I could share my stroke story, sell my books and raise awareness about stroke. 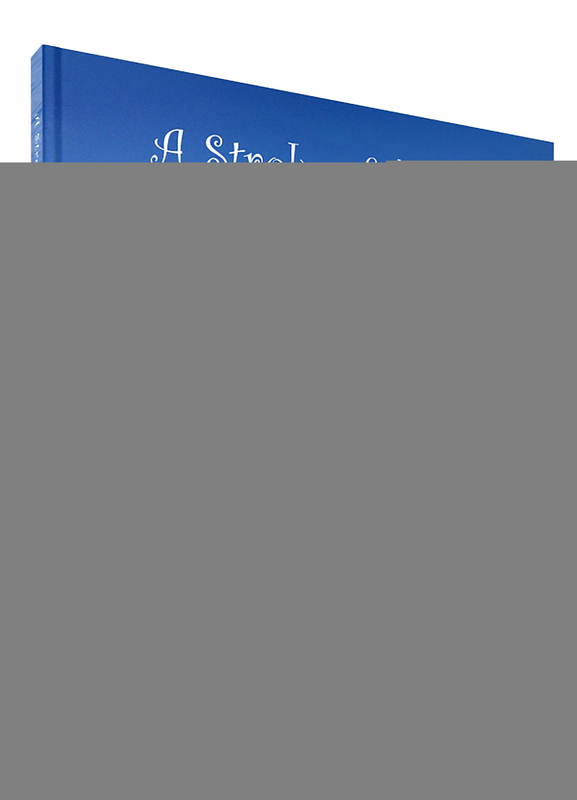 Here are some photos of my book signings and why I continue in raising awareness to fight stroke……. 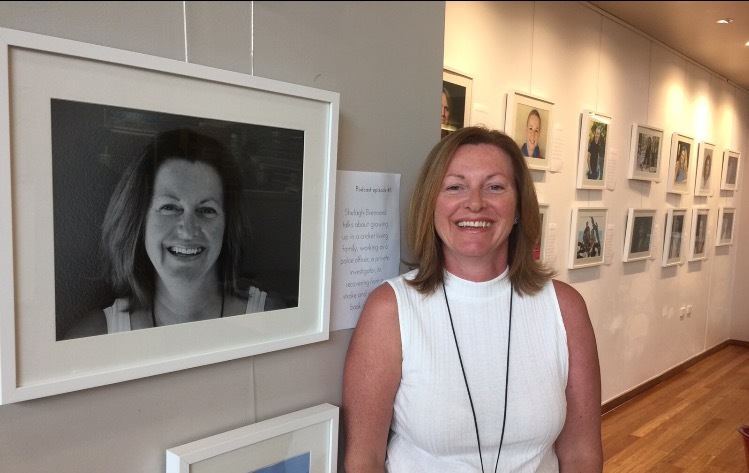 My beautiful friend Yenny Stromgren held an exhibition of her Everyday Light Warriors interviewees at the Junction, Noosa, during the month of September. This was a huge success, as she held it on the same day as ‘R U OK?’ day and she posted two of my poems I wrote during my post stroke depression. I was very proud to have them on the wall in amongst the photographs of those inspiring people she had the pleasure to interview. Please listen to my podcast and many others on her website. Although I was ill during the evening of her opening night, I was able to see the exhibition before it was all packed away for the next venue and we managed to get some lovely photos and I thoroughly enjoy spending time with this amazing woman. 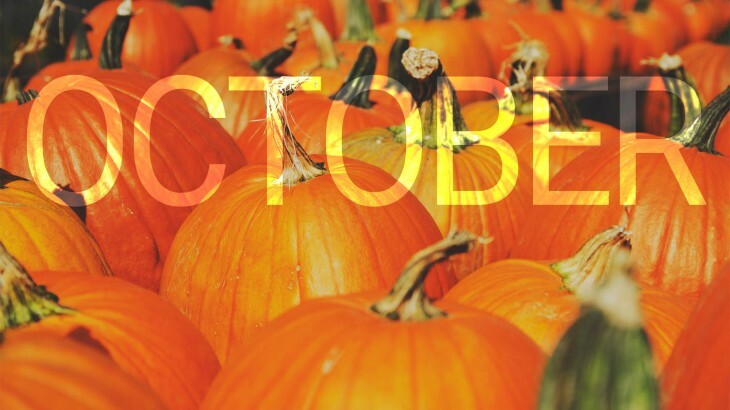 So..what’s happening in October? Marketing A Stroke of Poetry will continue with great gusto as usual and although I will be supporting Breast Cancer during ‘Pinktober’ through having fun at a few events, I have been able to share some book packs as raffle prizes, so I still leave my mark! During Queensland Mental Health Week (9-15 October), I will be presenting at Caboolture Hospital and sharing my story, specifically in relation to coping with depression and how I found inspiration through poetry and exercise. On the exercise theme, October 29 is World Stroke Day and Melinda Bingley, my good friend who owns and operates MAB Personal Training and Adventures is organising a special boot camp where some of the proceeds will be donated to the Stroke Foundation. Check out my Events page for more details on both these events. On a personal note, A Stroke of Poetry have sponsored a page of the Vintage Girls 2016 Calendar and I am helping my super friend and founder, Misty Bland, organise the Vintage Calendar Girls Launch on 22 October, in aid of Rare Cancers Australia. I will be dressed in my finery once again and showing how, at 53, I can still be a front page model of a calendar! If you fancy joining us for an evening of entertainment at Old Petrie Town, hop on line to buy a ticket or calendar. Also, and finally, I hear you gasp, with my good friend Mary Barber, Tamarind Book Club, we are hosting a Pop up Book Shop on 6 November, so I am busy helping Mary with the organisation of that event. More information on that event next month. I believe that brings me to a close for this month! Have a wonderful October and as always, please stay healthy and happy. 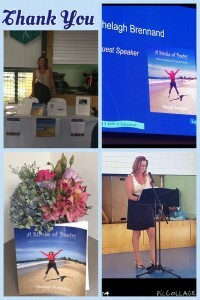 These were all wonderful comments made to me after my stroke presentation to The Rotary Club of Caloundra last week. For those of you that have met me or heard me talk, you will know that I LOVE to talk. I love to talk about anything and everything. Since my stroke, I am still troubled with ‘sensory overload’ and talking for too long, in busy, noisy places, with too many people and other such factors, affect my brain and give me headaches and bring on my fatigue. However, talking about my stroke, my book and presenting to groups of people who are interested in listening to my story, I seem to do OK and it makes me feel warm and fuzzy inside. When I presented to my son’s school, as part of the Womens International Breakfast event in March this year, one mum, the lovely Julianna was so inspired by my stroke story, that she wanted me to present to her local Rotary Club at one of their weekly breakfast meetings. I was extremely honoured to do so, to a gathering of around 35 people who greeted me with such warmth and positivity. What a superb group of people who, themselves, inspire me with their motivation to do such good in our community. 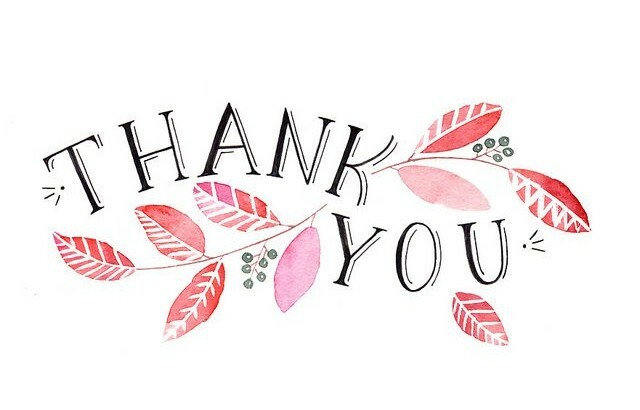 I sold ten books and although I donate $2 of all book sales to the Stroke Foundation, I matched that for the Rotary Club and they were certainly thrilled with that! This photo is of myself and Rotary Chairman for the day, Arnoldo Mendez, who gave me a very warm and kind introduction. So…that takes me to this last week…following on from my presentation last week, I have been quite ill. I do suffer with fatigue but having not been able to shift the horrid feeling of weakness, aching and lacking in energy, I decided to visit the Doctors who advised I may also have some sort of virus. Blood test results await! It made me seriously think about all the stroke survivors who suffer each and every day with chronic post stroke fatigue and are unable to function. I feel lucky enough to have only this temporary feeling but it was not until my friends watched a video that they truly understood how fatigue can be so disabling. The Stroke Foundation regularly publish literature and videos to assist those stroke survivors, carers, family and friends to help them understand about stroke. This video about fatigue hits the spot. Please take time to watch it and it may provide an insight into fatigue. As my ‘Dory’ featured image shows, we just have to keep ‘swimming’ when things just don;t go to plan. What’s in store for the weeks ahead?…. Being nominated as a finalist in the Creative Stroke Category of the 2016 Stroke Foundation Awards means I have been invited to a gathering next week of the finalists from Queensland and hope to meet other such inspiring people who have made a difference to others. 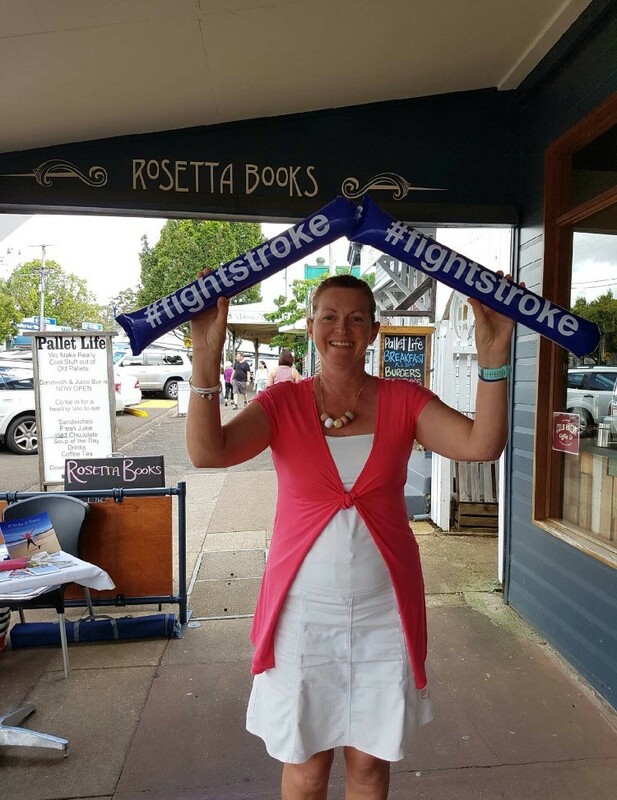 Also, as National Stroke Week beckons (12-18 September), I have my ‘Fight Stroke’ pack and I am planning book signings at local book stores, presentations and hope to raise awareness about stroke and health. October brings not only Breast Cancer month, but World Stroke Day is on 29 October and there may be a little something being planned for that. I shall keep you posted on events as they happen. As always, please stay healthy and happy. 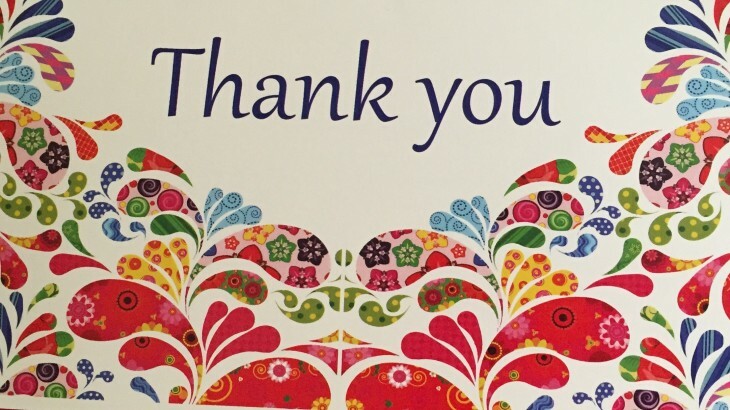 I received a lovely ‘Thank you’ card in the mail this month, and a receipt and letter from CEO Sharon McGowan (which also happens to be my maiden name), thanking me for the $400 donation sent to them. 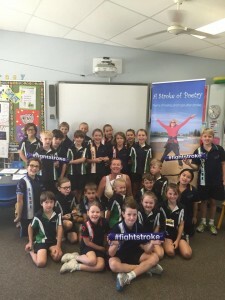 It is a great feeling that, as a self published author, I have sold almost 200 books and can begin to donate $2 from each book sold to the Stroke Foundation. 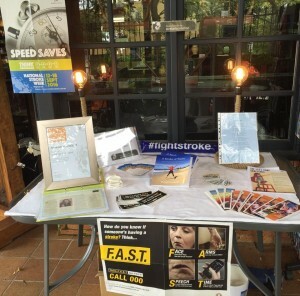 In her letter of thanks, Sharon McGowan pointed out, ‘a stroke occurs every ten minutes in Australia. It is the biggest cause of death and leading cause of disability, and the personal and social cost to the community is high’. The acknowledgement from Ms McGowan that donations enable the Stroke Foundation to reach more people in more communities across Australia – and save more lives – makes me happy that I can make a small contribution to this goal. 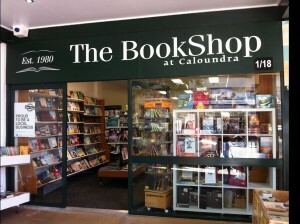 Whilst thanks are being mentioned, I would sincerely like to thank Graeme Bowden, owner of The BookShop at Caloundra who has supported, and continues to support, the self publication of my book A Stroke of Poetry,by selling my book in his lovely independent book shop; thereby helping me raise much needed funds for the Stroke Foundation. THANK YOU Graeme for everything you do in support of all local authors like myself. There are lots of things happening in the next few weeks…..further independent book stores across the Coast will be stocking my book, newspaper and magazine articles are being prepared for publication of my story and a ‘little birdie’ mentioned I have received nominations for the 2016 Stroke Foundation Creative Awards. I feel it is going to be an exciting time ahead. It has been a month since I last shared my news, which doesn’t mean that I have been ‘resting on my laurels’ during that time! 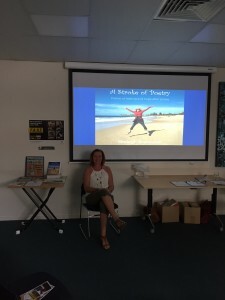 In this last month I have undertaken some library talks at Maroochydore and Caloundra Library. Both events were attended by a cross section of the local community who had suffered s troke, had limited knowledge of stroke and wanted to hear more; lovers of poetry and those who wanted to meet me because they were inspired by my book and my story. The feedback received was excellent and I was happy that I made the effort to share my story with others. If you missed these events, there was a great newspaper article published in the Sunshine Coast Daily last month. 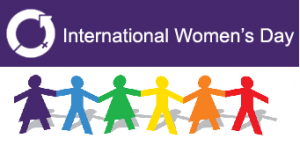 As a result of a presentation I undertook as Pacific Lutheran College on International Womens Day this year, I have a further ‘booking’ from the local Rotary Club at one of their breakfast in August. I shall very much look forward to that and promises of other events are forthcoming. Happy days ahead! I have also moved house and if anyone has ever moved from a large house to a much smaller home, you will understand the frustration of firstly, trying to make things fit. Secondly, deciding what to throw, sell and give away, but thirdly, realising that it a great cleansing process to be forced to start again. We are almost there, a few pictures to hang, and then it will be home. In regard to my book, I was honoured to be invited for interview by Yenny Stromgren from Everyday Light Warriors. Yenny interviews a variety of people who she finds have an inspiring story to tell and produces a Blog and Podcast for all to read and listen. 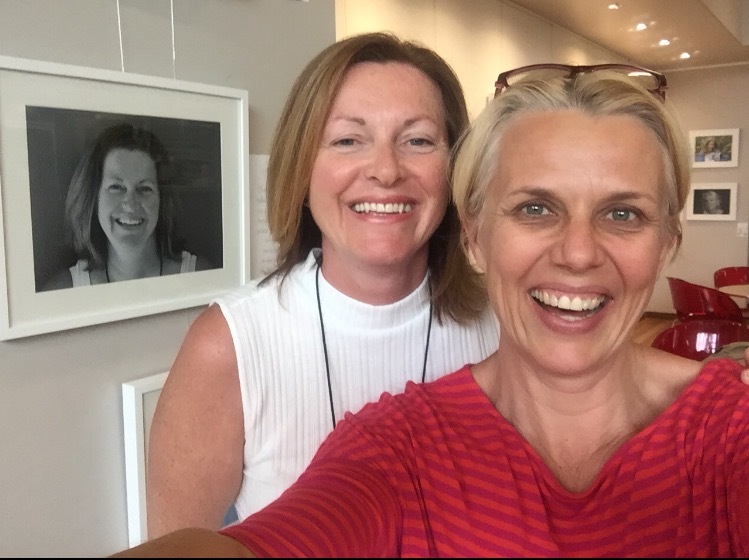 I was lucky enough to meet Yenny at one of the Sunshine Coast Womens Entrepreneurs Network events and pleased to say that the Podcast of my interview is out on 20th June.We are both excited about this collaboration and looking forward to sharing it with you all. 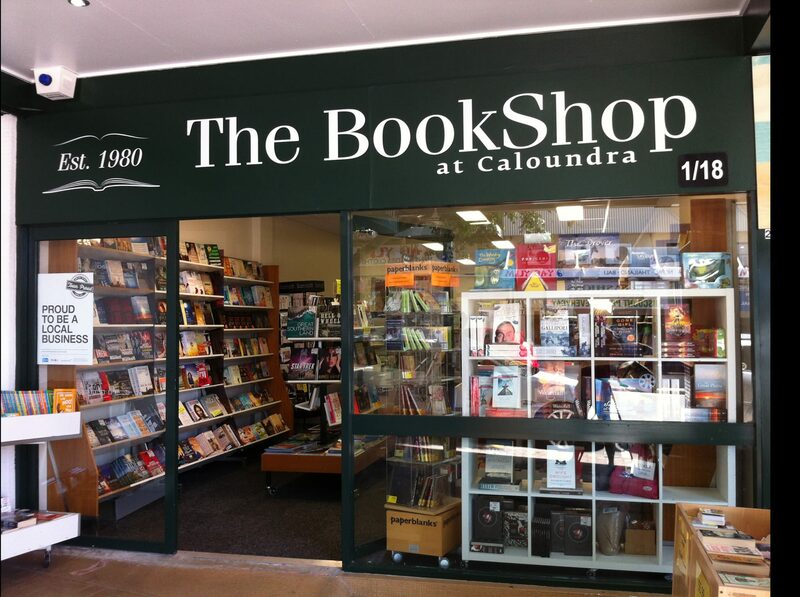 Graeme and Rosie at The BookShop at Caloundra have been huge supporters of my venture and continue to market my book and as such, the first consignment of A Stroke of Poetry is almost sold, bringing me close to 200 book sales since launch last October. That means my first donation of $400 to the Stroke Foundation is imminent. Whilst it’s raining, pop into The BookShop and see what Graeme has to offer. During June and July I will be progressing links with the local Health communities and hope to secure some book displays in local clinics and Health Centres to encourage my book to be purchased and shared by those who need motivation and inspiration in their lives. That’s all for now…so watch out for the Everyday Light Warriors podcast this coming Monday, 20 June. I am grateful to the journalists I have had the great fortune to meet over recent months which has culminated in this fabulous article published in the Sunshine Coast Sunday magazine yesterday (15.5.16). 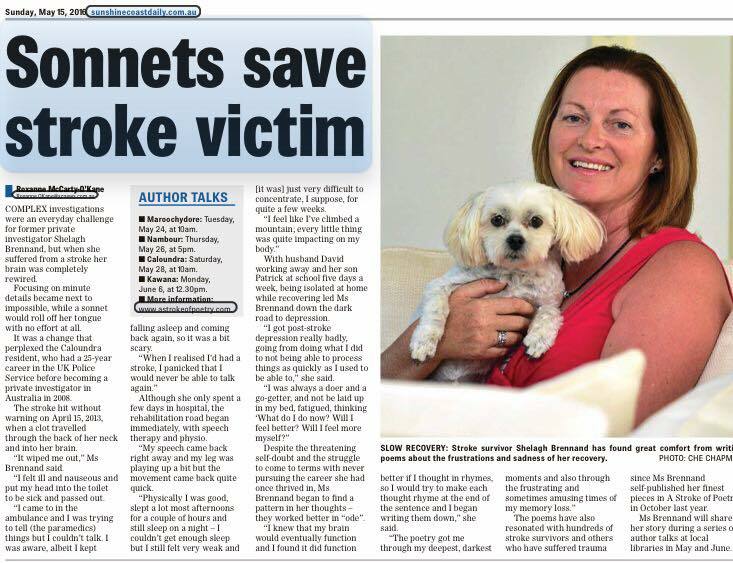 This story once again highlights, and reminds me, of the struggles I faced post stroke, and by overcoming them through poetry and exercise, I can now help and motivate others to do something positive with their lives. I love sharing my story, my poetry and meeting others who are happy to listen. Please come and meet me at any of the venues listed below and have an opportunity to purchase my book. This is a free event and will entail an in depth presentation about my life, my stroke and my extremely heartfelt, emotional recovery back to better health. Books will be available for purchase on the day. Everyone welcome but please book through Sunshine Coast Library website to avoid disappointment. Hello everyone! I am back from our big UK trip, having celebrated the 80th birthday of my mum and also my mum in law so it was lovely to spend time with close family and some extended family members. Unfortunately, we have returned with chest infections debilitating both my husband David and son Patrick. Gladly I am feeling well and within a week I was back to personal training and also joined a weekly runfit class, to prepare me for the Caloundra Foreshore 10K this coming June. I love the fact the weather is a tad less humid and I am enjoying being outdoors in the sunshine once again. 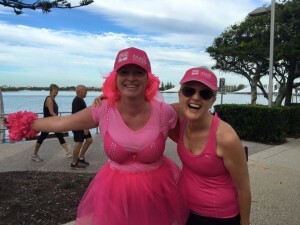 Here is a recent photo of me and my friend Melinda Dines as we took part in the annual Pretty in Pink Bra Walkathon which raised over $20,000 for a local woman who has recently lost her life to breast cancer. Hop onto the PIP Facebook page if you want to find out more. Also returning from holiday means that I need to get back into marketing A Stroke of Poetry. 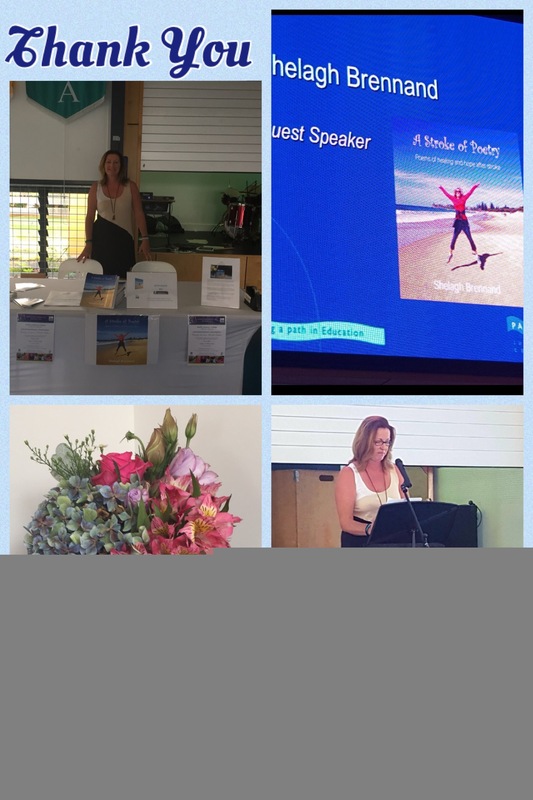 Last week I presented my story to participants of the MAB Personal Training & Adventures ten week challenge and delivered my story of positivity following my stroke and how I overcame many challenges through poetry and exercise. 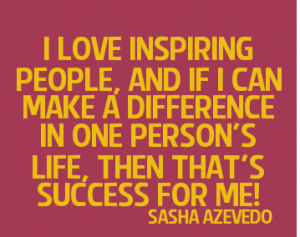 The feedback was great and I was honoured to speak with others who have also inspired me. On 15 April, this was my three year ‘anniversary’ since my stroke and I am extremely happy with where I am and what I am doing in my life. This is always a cause for celebration and why shouldn’t it be? I am fit, healthy and have written a book which is now helping others to overcome similar obstacles and challenges in their lives. I am very much looking forward to my forthcoming library talks, where I share my story and some poetry. These are being organised by Sunshine Coast Libraries and here are the Sunshine Coast Library locations and dates which are also detailed on the Events page of my website. That’s it for now but if you need any further information about the book or forthcoming events, please get in touch. 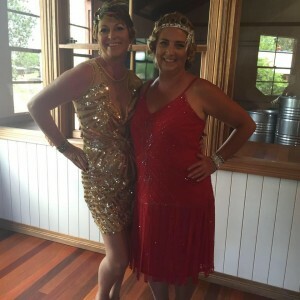 Stroke survivor to Vintage Calendar Girl! Who would have ever thought that I would have suffered a stroke? 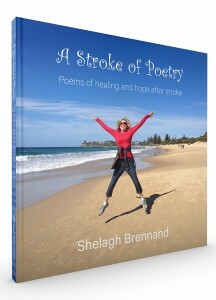 Who would have ever thought that I would have written poetry and self published my book A Stroke of Poetry? I have always believed that things happen for a reason, life is very much what you make it and we have to seize opportunities as they arise. Without my stroke I would not have had a poetic brain. 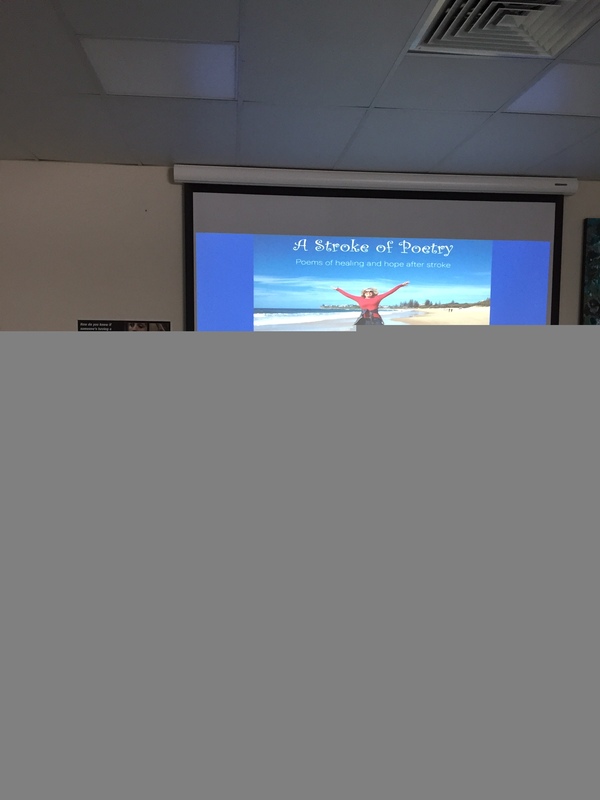 Had I not posted my poems on the wonderful FAST parenting after a stroke then I would not have gained feedback and support into having them published. Had I not met the lovely and talented Alex Mitchell, Author Support Services and attended her ‘Self to Shelf’ Book Workshops in August 2015 I would never have met my lovely friends Allison McMaster and Misty Young Bland. 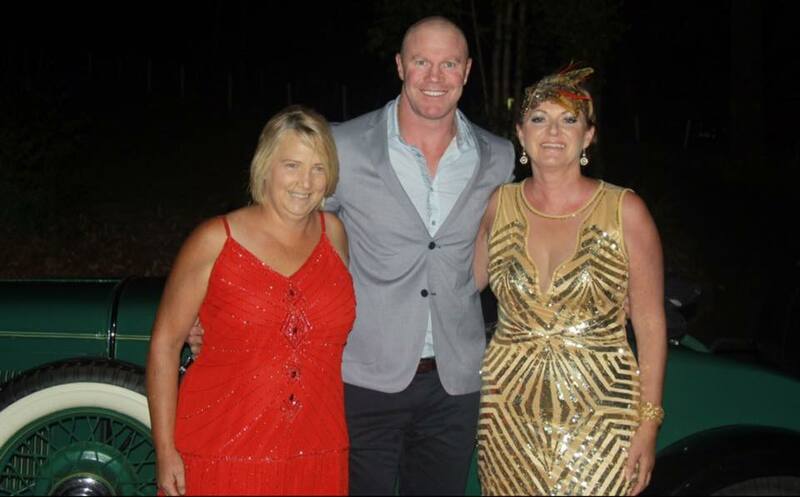 Misty is the founder and organiser of the The Vintage Calendar Girls. After a very successful 2016 Vintage Girls Calendar, raising much needed funds for Rare Cancers Australia, Alli and I were asked to model on the front cover of the 2017 Calendar. So, without my stroke I would not be a front page model with Alli and the AFL legend Barry Hall! There is a great article in the Sunshine Coast Daily written by journalist, Roxanne McCarty O’Kane after our first photo shoot at Old Petrie Town and a short video from Channel 7. It would be lovely if you could follow our success this year by visiting The Vintage Calendar Girls on Facebook and ‘liking’ the page. My blog will be quiet over Easter as I am taking a trip to the UK to celebrate both our mums reaching the grand age of 80. I am sure there will be many celebrations and I hope that you all have a wonderful Easter. A huge, heartfelt thank you goes out to Pacific Lutheran College for including me as a Guest Speaker at their International Women’s Day Breakfast this morning. I had a thoroughly lovely time, mixing with lots of like minded women (and gents) who appreciated my presentation and my positive story after stroke. 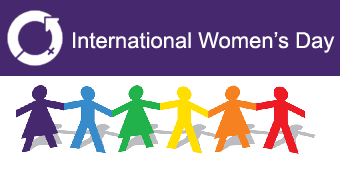 It once again reinforces the amount of empowering, inspiring women I have in my life who have supported me since my stroke and continue to support me in my venture. Thank you to the school for helping me spreading the message, helping me sell a few books along the way and presenting me with the lovely flowers.